This Spring the UK Dog Rescue Federation and Hull City Council launch a partnership, the first of its kind, to help bring awareness of the plight of abandoned dogs and its effect on communities. ‘Helping Hull’s Hounds’, a six-month pilot partnership which was officially launched by the Deputy Lord Mayor Cllr. Harrison, will form an integral part of the federation’s national programme to help fight the current dog crisis, which, it claims, is largely fuelled by an increasing number of unlicensed private breeders. 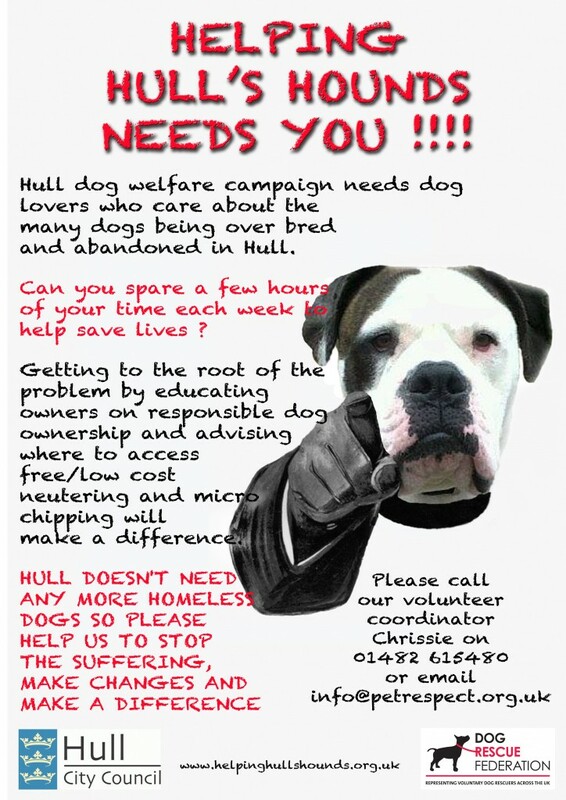 In recent years, Hull’s rescue shelters have become increasingly overwhelmed by an unsustainable influx of abandoned dogs. In fact a recent survey conducted across the country and by region shows Hull’s stray dog problem in 2013 was roughly double the size of the national figure. Endorsed by celebrities such as Peter Egan, Martin Clunes, Joanna Lumley, Philip Franks, and Anthony Head, the primary purpose of the UK Dog Rescue Federation is to raise public awareness of the increasing number of dogs being bred illegally, whilst, ironically, a growing number of healthy young dogs are being put down.